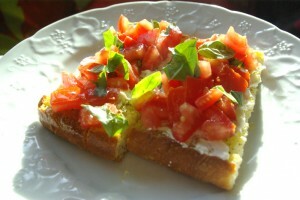 This Bruschetta Recipe is one of my nicest things to eat for lunch. So fresh, so crunchy and so Italian. This picture of freshly made Bruschetta was just about to be demolished by Erik and myself the other day for lunch. Like most of the UK these last few weeks, our weather here, in East Yorkshire, has been beautiful. Sunny, warm, blue skies and fluffy white ‘cotton-wool’ clouds – even though it is early morning. Normally at this time of year, we graduate towards lunchtime, open the fridge door and put together a jumble of whatever can be seen calling out to us on the shelves, or in the vegetable or salad drawer. Sometimes cheese on toast with a ripe grilled tomato scattered with fresh oregano leaves, or carrot or cauliflower soup, hustled up in our favourite Eva Trio pan. But on this particular day, I had a fancy for a simple bruschetta, and we just happened to have all the perfect ingredients. And it only takes under 10 minutes to prepare and cook. What could be easier? So the ciabatta was sliced in half with a sharp knife, and brushed well with the oil. Large frying pan was switched on to fairly hot, and when it was ready I put the soft side of the ciabatta down on the pan, and squashed it a bit flatter. Whilst that was frying, I halved the tomatoes and, using a tea spoon, extracted the seeds. Then I chopped the tomato halves into small bite-sized pieces. The basil leaves were torn up, and most of them were added to the tomato pieces in a bowl and mixed with a drizzle of the fruity oil. Not too much – just a subtle taste. Checked the ciabatta to see how it well it was doing – it needs to be gently crispy in the middle and crispy on the top edges – all golden. I pressed it down again for another couple of minutes, then it was ready. generally it takes about 5 minutes in all – a lot quicker than in the oven. As soon as you take the ciabatta out of the pan, cut a clove of garlic in half and rub the clove over the crispy surface – it takes on a gentle garlic aroma. Then cut the ciabatta into the correct size for your portions, put on a plate, spread with the cream cheese and pile the mixed tomato and basil mix on top. 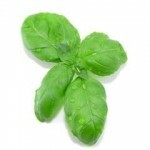 Scatter a tiny bit of crunchy sea salt on each, maybe a twist of freshly ground black pepper and the small basil leaves to decorate. Drizzle a tiny bit of oil over. This is my favourite Bruschetta Recipe. Then find a chair, sit down and eat this Bruschetta. Every mouthful is crunchy (the ciabatta) yet soft (the tomatoes), with a gentle hint of garlic and basil, the tang of sea salt, and reminds me so much of Italy.